The Domesday Book records a church and priest at Colwick in 1086. The listed grade II church dedicated to St John the Baptist now stands in ruins near Colwick Hall. It was built by Sir John Byron in the 16th century incorporating 14th and 15th century sections from an earlier church. 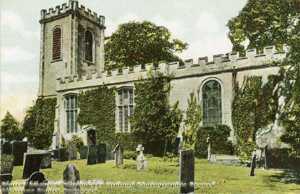 In the mid-17th century the church was repaired and a chancel and steeple built by Sir John Musters. Later in the century, the tower and chancel were rebuilt. Towards the end of the 19th century, a vestry and an organ chamber were added. By the early years of the twentieth century, the church was in a poor state. Although repairs were continually made, the condition of the church deteriorated. In 1936 it was finally closed as being unsafe. A new Church of St John the Baptist was built in Colwick in 1950. The church was noted for the grand monuments to the Byron and the Musters families who had been patrons of the church at various times. When the church was abandoned, the Byron family monuments were removed to the crypt of Newstead Abbey and the Musters family monuments to All Saints Church at Annesley. In the 1970s, the church ruins were made safe, most of the headstones were cleared from the graveyard and the grounds set out as a quiet sitting area.